ComScore keeps a list of what it calls “social networking” sites, but these include blogging platforms and other social media sites as well. While the audience for blogs is still showing healthy growth overall, Facebook stands out as the social gorilla taking share from not only other social networks but blogs and other social media as well. 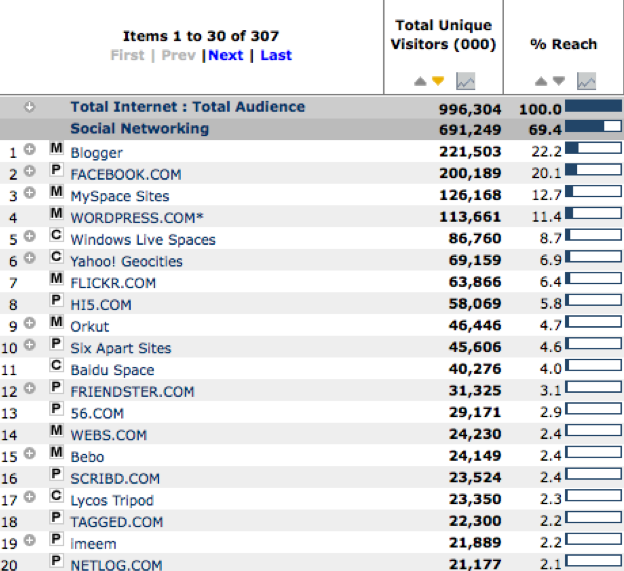 Below are the top 20 sites on comScore’s social networking list. It is really more of a social media site list, which is what I’m renaming it for this post. It is not definitive, but it gives a good lay of the land. (Here is a similar ranking from 2007). Note on this list the stubborn persistence of Yahoo’s Geocities at No. 6, the rise of Yahoo’s Flickr at No. 7, Six Apart at No. 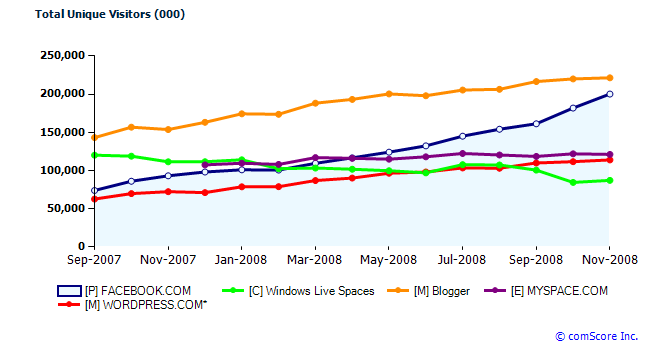 10, and the presences of Chinese sites like Baidu Space and 56.com. The real surprise, though, is document-sharing site Scribd at No. 16, with nearly 24 million worldwide uniques.